Take off in a seaplane for a fantastic journey deep into Denali’s remote backcountry. Your flight will take you through the Great Gorge for an awe-inspiring up-close views and an opportunity to view the great one, Denali (formerly Mt. McKinley). Your seaplane will land on a small glacier, Lake Moraine, under Mt. Church, 12 miles from Denali’s 20,320 foot summit and between the Backside and Ruth Glaciers. 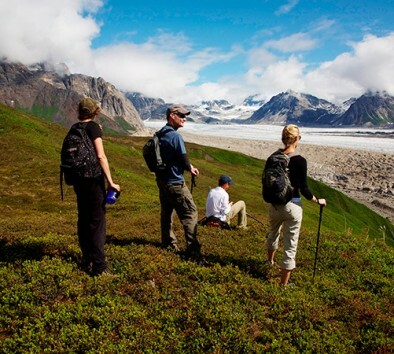 Hike off trail with your small group into Alaska’s most amazing remote wilderness areas. Unlike other trips into the park, you and your guides will be among the few in this area of Denali. Experience clear streams, grassy heather slopes, snowy and spectacular views of the winding glacier below. Return to Talkeetna after a truly amazing day in Alaska’s roadless wilderness. Minimum age is 8. Maximum weight is 400 lbs. Dress in warm layers. Wear comfortable walking shoes. Bring rain gear and bottled water. Tour operates subject to meeting a minimum number of participants. Tour takes place in Talkeetna. Flight time is approximately ½ hour with 2¼ hours of hiking.